There are thousands of species of bees in the world. Our favourite, the honey bee, is just one of the estimated 25,000. It’s not even the cutest, friendliest, or most interesting. Those qualities go to some fascinating creatures you will discover in a lovely new book, Bees: An up-close look at pollinators around the world. 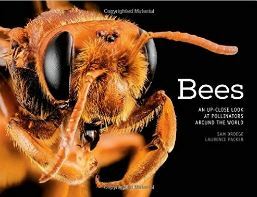 The book is jammed with full-colour close-up photographs of wild bees – especially in their role as the world’s pollinators. Examples from around the world are arranged by continents into 7 chapters. Antarctica isn’t represented, but 7 regions/continents are still there because Central America and the Caribbean are given their own section. The isthmus and islands deserve the coverage. There are some stunning bees in that area. 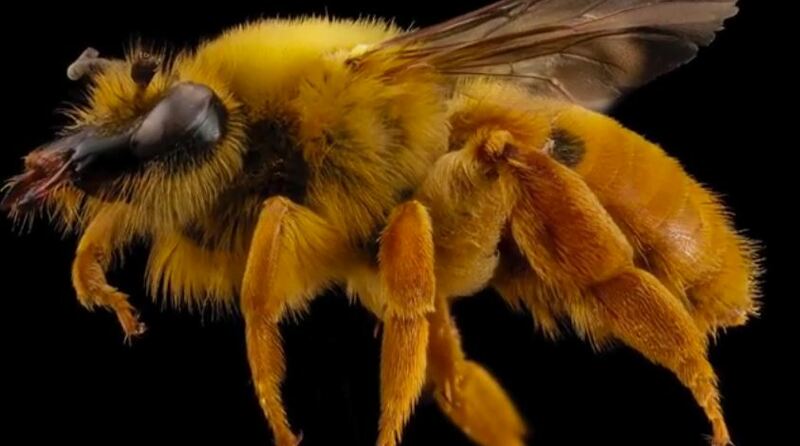 The North America section covers 18 species, including a gentle Bombus griseocollis (Brown-Belted Bumblebee) collected in Washington, D.C., and an affable Anthophora affabilis from the South Dakota Badlands. 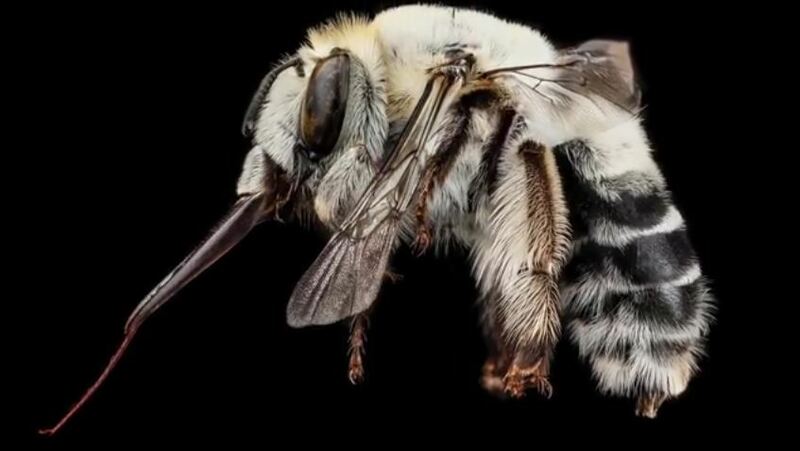 The latter, a gray/white badlands bee, is found world-wide (except Australia), so you may have already encountered a subspecies of this fluffy burly Flower-Lover. The one shown below has an enormous tongue, adapted to reach nectar found deep inside a species of an abundant badlands flower. 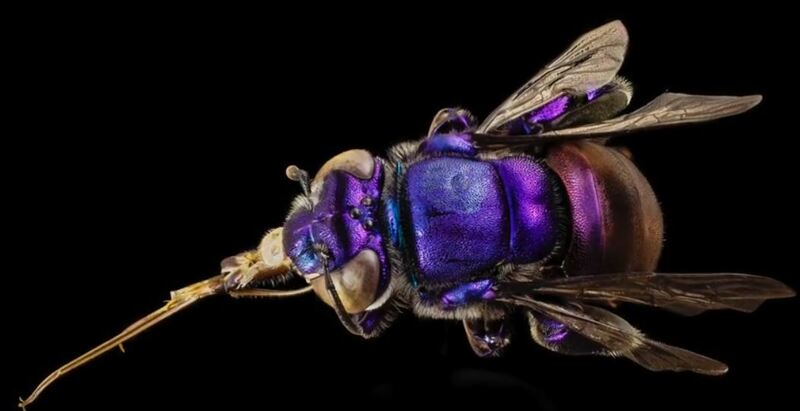 The authors of Bees: An Up-Close Look at Pollinators Around the World, Sam Droege (United States Geological Survey) and Laurence Packer (Toronto Biology Professor at York), have produced a stunning volume. I especially like how they advocate for the citizen scientist. They share camera tips that resulted in their gorgeous photographs. We are told that their camera is no big deal – many amateur photographers have the same equipment. They used a Canon EOS 5D with a 65 mm 1-5x lens. A direct flash at the subject would have resulted in a stark contrast so (I like this!) they use an inverted Styrofoam beer cooler to bounce a more diffuse light towards the bees. I won’t give all the details, you can read their book, but one of the things that makes the bee photography so stunning is the slight (5-power) magnification. As any of you who have peered through a microscope know, a down-side to magnification is the very narrow range of what stays in focus. To see more of your subject, you have to move the lens and refocus so that a different part of your specimen is sharp and clear. But the pictures in this book have a wide range of detail, all nicely in focus. To achieve this, they photographed a series of images, each with the lens slightly shifted, then they used over-the-counter image merging software. It was obviously a lot of work. The results are brilliant. The book lacks an index so it is hard to quickly look up a favourite creature. Almost all the North American species were from Maryland or the US east coast. The North American section includes Apis mellifera, our common honey bee. The honey bee is certainly widespread and important in North America, but it is an introduced (just 400 years ago) invasive species which has uprooted and displaced native North American pollinator bees. The authors should have at least pointed out that honey bees are not North American natives. Nevertheless, don’t let these issues detract from the quality of this lovely, well-designed book. It will make a great holiday gift for any beekeeper or naturalist on your shopping list. You may like to check this 1-minute video, narrated by author Sam Droege, to learn more or to simply enjoy the photography. You might also take a peek at Droege’s Flickr page which features more of his brilliant photography. You can order your own copy of this engaging book either through the publisher, Quarto, or from Amazon.com in the USA or Amazon.ca in Canada. This entry was posted in Books, Pollination and tagged bee species, Native Bees, Sam Droege, wild bees. Bookmark the permalink. Thanks, I’ve added this to my bee books wish list.